Have you heard? Revolution has come up with a skincare line that’s almost an exact dupe of The Ordinary. Just look at the packaging. Revolution’s a little fancier, but you can’t miss the resemblance. Even the product names are pretty much identical. But what about the formulas? We love The Ordinary because their stuff works. You can copy the look, but if the goodies inside don’t deliver the same results, you’re another copycat heading towards oblivion. You’d be forgiven for thinking 0.2% retinol is a pittance. Like, that’s so small, why would you even advertise it?! Don’t skincare goodies work only when you use 10% or something high like that? Most of the time, yes. But, there are exception. Retinol is one of them. This form of vitamin A is so powerful, it gives you results even at incredibly low concentrations. Go too high with retinol and you’ll have to deal with irritation, peeling, flaking and all that jazz. FYI, powerful means harsh in skincare. The best away to use powerful actives without experiencing side effects is to start small. Both The Ordinary Retinol 0.2% In Squalane and Revolution 0.2% Retinol Serum have 0.2%, the right concentrations for beginners. 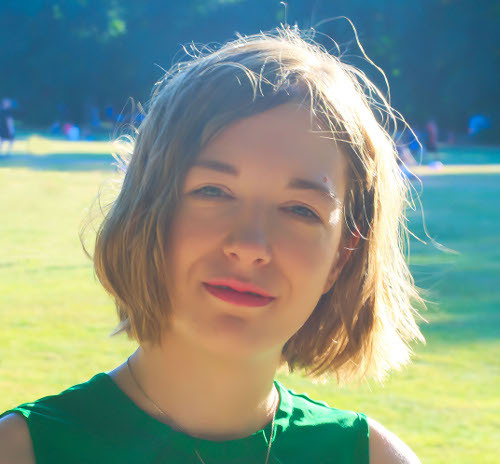 It’s high enough to slow down the ageing process and low enough not to irritate skin (unless yours is super sensitive and can’t tolerate retinol at all). It has antioxidant properties that destroy free radicals before they give you wrinkles and dark spots. It accelerates cellular turnover (i.e. the skin’s natural exfoliating process), reducing the appearance of dark spots and wrinkles. It boosts the production of collagen, the protein that keeps skin firm. Retinol is the real deal. Forget the hype about peptides, EGF and snail slime. Vitamin A (retinol included) is the ONLY thing proven to reduce wrinkles so far. If you’re serious about antiaging and you’re 25+, you need this. Both The Ordinary Retinol 0.2% In Squalane and Revolution 0.2% Retinol Serum are oil-based. The reason is simple: oils are moisturising and counteract the drying effects of retinol. The Ordinary Retinol 0.2% In Squalane has made the better choice here. Squalane is one of only 3 oils that is safe for everyone, including fungal acne sufferers. Non-comedogenic, Squalane is a natural component of your skin’s natural barrier. This means your skin instantly recognises it as a friend. It sinks in quickly and moisturises well – without irritation. Revolution 0.2% Retinol Serum went with coconut oil, grape oil, sweet almond oil and sunflower oil. All these oils are super moisturising BUT the chance you’ll get a breakout is higher. It’s not a given. Dry skin can use oils safely without getting a single zit. But coconut oil (the main oil in the serum) is known for breaking out oily skin. If that’s the case, The Ordinary is a better choice for you. Not much else. Both The Ordinary 0.2% Retinol In Squalane and Revolution 0.2% Retinol Serum keep it simple. An oil base + retinol to fight wrinkles without drying out skin. No fragrance or irritants that cause unnecessary problems. On the other hand, you won’t find antioxidants or extra goodies here. That’s why the prices are so low. If you have dry skin, Revolution 0.2% Retinol Serum is well worth a try. It’s the most moisturizing of the two. Anyone else, stick to The Ordinary Retinol 0.2% In Squalane. The extra oils in Revolution could break out skin that produces a little too much oil. 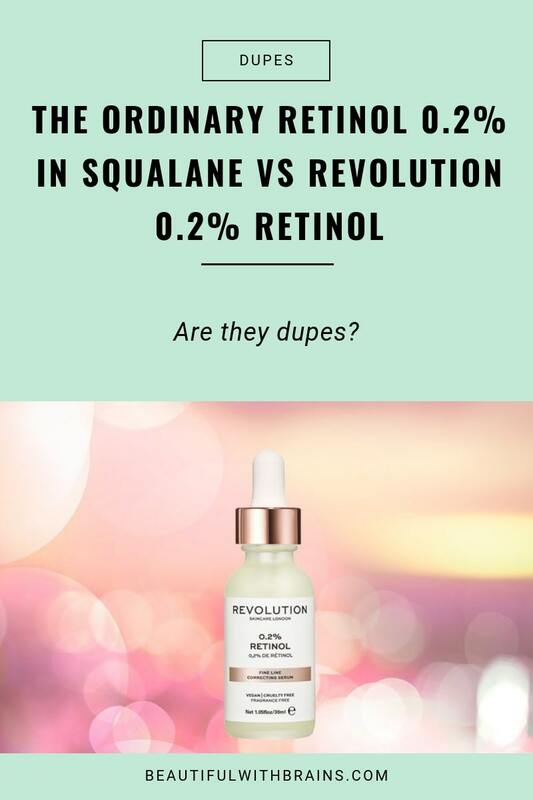 Is Revolution 0.2% Retinol Serum A Dupe For The Ordinary Retinol 0.2% In Squalane? I wouldn’t say that Revolution 0.2% Retinol Serum is an exact dupe for The Ordinary Retinol 0.2% In Squalane, but it’s close enough. It’s more moisturizing, so dry skin will like it a lot more. For oilier skin types, The Ordinary is the best choice. What’s your fave: Revolution 0.2% Retinol Serum or The Ordinary Retinol 0.2% In Squalane? Share your pick in the comments below. Revolution 0.2% Retinol Seum Ingredients: Caprylic/Capric Triglyceride, Cocos Nucifera (Coconut) Oil, Vitis Vinifera (Grape) Oil, Prunus Amygdalus Dulcis (Sweet Almond) Oil, Helianthus Annuus (Sunflower) Seed Oil, Retinol, Polysorbate 20, BHT, BHA. The Ordinary Retinol 0.2% In Squalane Ingredients: Squalane, Caprylic/Capric Triglyceride, Retinol, Solanum Lycopersicum (Tomato) Fruit Extract, Simmondsia Chinensis (Jojoba) Seed Oil, BHT. I recently read that retinol can darken skin by stimulating melanin which conflicts with reports that it fights pigmentation by increasing skin turnover. I am thinking of staying away from it since I am trying to reduce pigmentation. But it’s effects on wrinkles make it really tempting. Sally, where did you read it? It’s the first time I hear of it!